The all-new XC90 is without any doubt Volvo's most important model in recent years as even the company's CEO said in an interview it's the last chance for the Geely-owned brand. The mid-size luxury SUV adopts an evolutionary design with more refined lines and an overall elegant look which is hard to find in this segment given the usual shape of SUVs. At the front we notice the very attractive headlights featuring "Thor's Hammer" LED daytime running lights flanking a generous chromed grille with vertical double slats. The fog lights have been positioned low in the bumper while the aluminum inserts provide a more upscale look. The side profile shows some clean lines forming an uncluttered design with chrome window framing, a big rear-side window and up to 22-inch alloy wheels. Volvo went for a more modern interpretation of the XC90's signature taillights which now look sharper and suit the model very well. There's also a prominent roof-mounted spoiler and depending on the version there are round or rectangle double exhaust tips. For those wanting a more rugged look, Volvo will be offering dark plastic mouldings on the wheel arches, bumpers and side skirts instead of an aluminum finish. The interior cabin was revealed towards the end of May showing a minimalistic configuration with only a few buttons as most of the knobs have been replaced by a generous touchscreen display. The cabin can host up to seven people sitting on soft leather upholstered seats and enjoying a four-zone climate control system and a 1,400-watt, 19-speaker Bowers & Wilkins sound system. The Swedish marque has used a combination of aluminum inserts, wood trim and other premium materials to create what they describe as being the most luxurious interior ever seen in a Volvo. It will boast a digital instrument cluster and diamond-cut controls for volume and start/stop, while "state of the art" voice recognition and Apple's CarPlay integration are also on the menu. 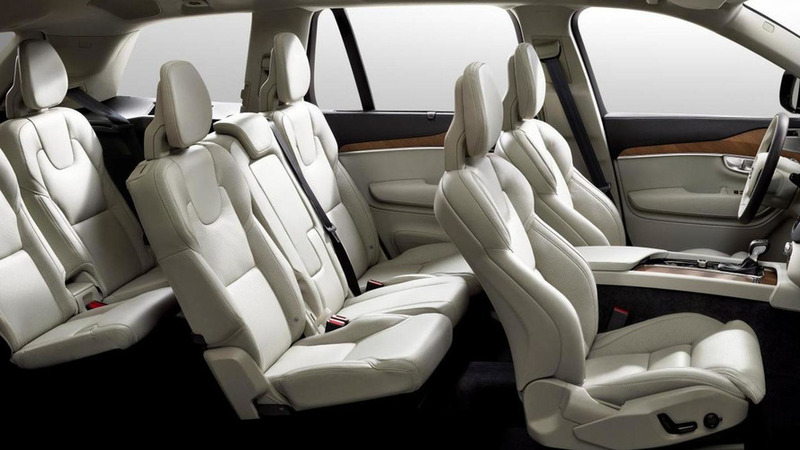 Volvo says the third row of seats can host people that are up to 1.7 meters tall and each passenger will benefit from its own stowage space. Also inside the spacious cabin there's a HERE navigation system and an Ericsson-based cloud solution. Riding on the brand new Scalable Product Architecture, the 2015 Volvo XC90 will come with an extensive array of safety equipment such as auto brake, road edge and barrier detection, driver alert control, lane keeping aid, road sign information, blind spot information, queue assist, pedestrian detection in the darkness and rest stop guidance and many others. As far as the engines are concerned, the second-gen XC90 is billed as being "the world's most powerful and cleanest SUV" thanks to a brand new range of Drive-E engines which all have four cylinders. The twin-turbodiesel D5 packs 225 bhp (168 kW) and 347 lb-ft (470 Nm) and allows the vehicle to return 39.2 mpg US (47 mpg UK or 6 liters / 100 km). A D4 with 190 bhp (142 kW) and 295 lb-ft (400 Nm) will also be offered and promises to do 56.5 mpg US (47 mpg UK or 5 liters / 100 km). If you prefer gasoline motors, Volvo has prepared a T6 turbocharged & supercharged engine rated at 320 bhp (239 kW) and 295 lb-ft (400 Nm). A lesser T5 variant will also be available with 254 bhp (189 kW) and 258 lb-ft (350 Nm). The XC90 is also getting a T8 plug-in hybrid derivative featuring a 2.0-liter turbocharged & supercharged four-cylinder motor driving the front wheels and an 80 bhp (60 kW) electric motor to power the rear axle. It has a combined output of 400 bhp (298 kW) and 472 lb-ft (640 Nm) and will do 25 miles (40 km) solely on electric power. There will be a First Edition series consisting of 1927 (the year Volvo was founded) individually numbered cars powered by either the T6 or D5. These will be sold exclusively online and will be distinguished by an onyx black exterior, 21-inch eight-spoke Inscription wheels as well as amber Nappa leather seats, walnut inlays and a charcoal leather-wrapped dashboard. Production of the second generation Volvo XC90 will kick off at the beginning of next year in Torslanda, Gothenburg, with deliveries expected to commence in May. In United States, the XC90 T6 AWD will cost 48,900 USD, followed by the T6 First Edition at 65,900 USD which will be available on order online from September 3.